This entry was posted in Wild Horses in USA on October 15, 2010 by Elke. Thank You Governor Richardson for purchasing 12,000 acres for the sanctuary of our Wild Horses, a landmark action to ensure their safety. Austin, a rescued wild mustang ridden by James Anaquad Kleinert, director of “Disappointment Valley”, side by side with renowned Mustang expert and filmmaker, Ginger Kathrens will hand deliver your personal letters directly to New Mexico’s Governor, Bill Richardson. Sciences will begin it’s Congressionally-requested investigation of the Bureau of Land Management’s (BLM) wild horse and burro program in 2011 but it will too late for the Red Desert herds without an immediate moratorium on roundups. HOUSTON (SFTHH) – Joining with the ASPCA, HfHAC filed a well planned and thought out law suit seeking to stop the Bureau of Land Management (BLM) from stampeding a herd of Colorado wild horses into oblivion. The catch; the suit was filed in New York and the action has made the BLM’s head spin. In Nevada, in just a few weeks’ time, we citizens have to choose between two Senatorial candidates – incumbent Senator Harry Reid or his challenger, Sharron Angle. 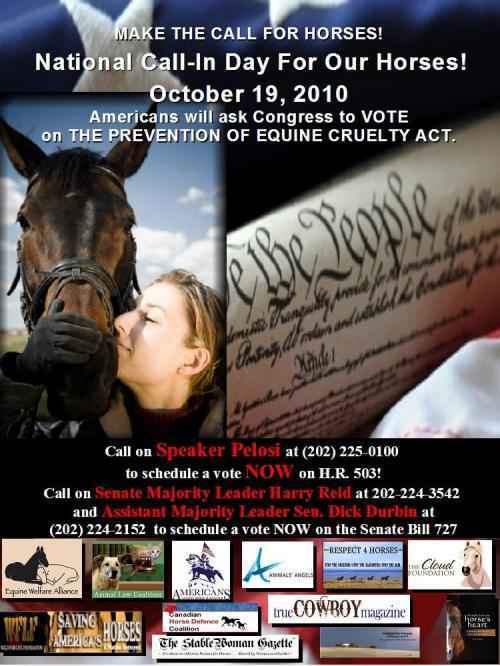 Now if you are a wild horse advocate that is a rotten choice! Why you may ask? Let’s begin with Mrs. Angle. When I personally spoke to Sharron Angle months ago about the terrible demise of the wild herds in our state and the loss of potential eco-tourism jobs, she clenched her fists and said for the sake of full disclosure, her husband had worked for the BLM in Tonopah for many decades and that those horses were starving on that range, and it was a good thing that the BLM pulled them off. And if I wanted to see wild horses in good condition I should go to the Palomino adoption facility near Reno NV and see how much better off they were there. Well I have heard quite a few negative things about that facility and its’ care of wild horses, but Mrs. Angle closed the discussion by walking off, angry it seemed. Laura Leigh did it rather down and dirty, yesterday, on her blog. To the point and with little fanfare she stated that the two organizations that are currently out on the legal battlefield slugging away to save what is left of our wild horses are Grass Roots Horse and the HfH Advisory Council, and that they need your support. We got National media attention on MSN, CBS, ABC, and Local TV Stations on the story below! Thanks to the Associated Press for running this story and getting much needed attention to our beautiful wild mustangs!! They need all the help that we can give them! 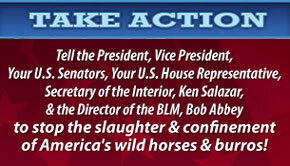 Please take time to click the Pony Express button on our homepage and take action for the roundups to stop! This is only the beginning of what we can do to save a huge piece of our American heritage! Please cross post this and get all the attention we possibly can on this issue! This entry was posted in Wild Horses in USA on October 9, 2010 by Elke. Not far away from the glitter metropolis Las Vegas in Nevada you can watch Wild Horses in the area of Cold Creek. Mustangs are often close to the little village and they are not very shy. 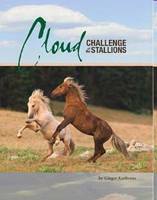 This entry was posted in Wild Horses in USA on October 9, 2010 by Andreas. 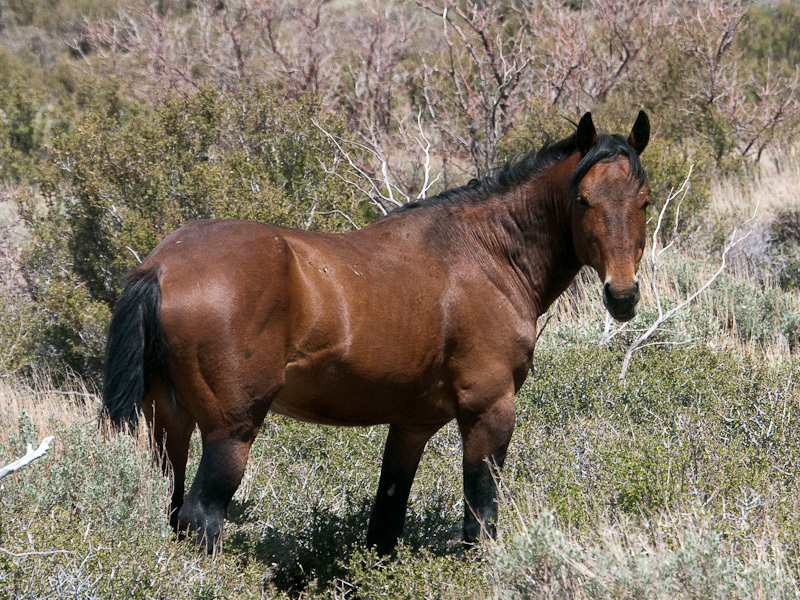 In the early morning of Wednesday, October 6, 2010, amid the vast landscape of the Silver King Herd Management Area in southeastern Nevada, a mustang family lost everything in a BLM helicopter roundup. I looked down from a hill above the entrance to the capture site to see a striking white mare, running at full speed, with her young foal at her heels. Galloping just ahead of the helicopter was a beautiful sorrel stallion, forehead lined with a wide white blaze. 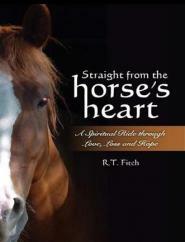 He lagged behind his family, torn between making a run for freedom and protecting his mare and foal, even if that meant following them into the jaws of the trap. The stallion, who we have named Braveheart, chose family over freedom, and it cost him his life. This entry was posted in Wild Horses in USA on October 8, 2010 by Elke. Join Big Blend Magazine editors Nancy & Lisa, and guest co-host Eddie Maldonado, for Big Blend Radio. On ‘The Success Express’, Jerri Palumbo will discuss Marketing Plans. On ‘Vacation Station’, Michael Cervin will chat about his book ‘Santa Barbara & The Central Coast’. 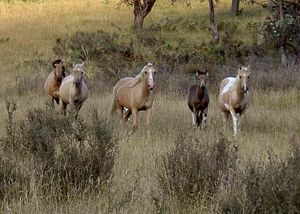 And on ‘The Nature Connection’, we’ll discuss the BLM Wild Horse Round Ups with GrassRootsHorse.com activists: Maureen Lynch Vanderstad, Laura Leigh, Dallas & Debbie Gulley, and Gordon M. Cowan, Esq. Protests in Boston, Connecticut, Las Vegas, Utah, Sacramento, Boulder and Arizona planned for October! 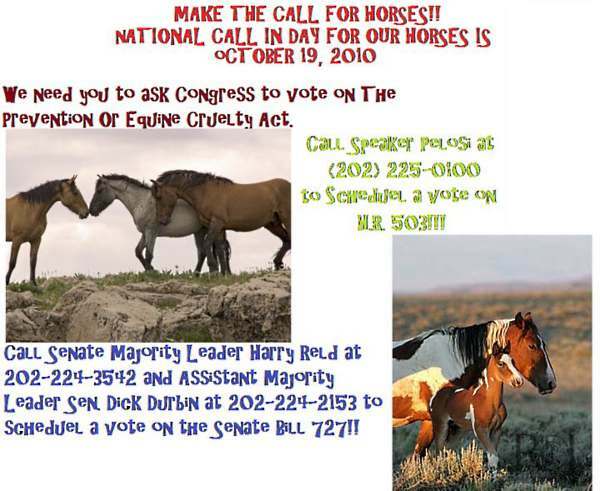 Please join a rally and/or start your own- time to shout out again for a moratorium on roundups and protection of our wild horses and burros! Visit the Cloud Foundation calendar for all the details! Thanks to all the organizers for their tremendous work. Spread the word (shortlink: http://bit.ly/WHprotests). Boston, MA (October 7, 2010)— Following over 35 protests in late 2009/2010, rallies will resume this month in at least seven states nationwide to draw attention to the plight of America’s wild horse and burro herds. Protests in 12 more states are in the works. Currently nearly 40,000 wild horses and burros are held in pens and pastures at taxpayer expense while the Bureau of Land Management (BLM) private contractors rush to roundup over 3,200 more wild horses and burros before the end of the year.